What Does a Low-Carbon Future Look Like? Free Online Graphic Design Sites: What’s the Catch? As a blogger or content marketer, you probably spend a fair bit of time searching for unique, usable photos and graphics to illustrate your blogs and social media posts. Chances are, you’ve discovered that having a designer produce all the illustrations you need every day would be prohibitively time-consuming and expensive; and at some point you’ve probably turned to free online graphic design sites like Canva or PicMonkey. Before I go further, I’d just like to say that I’m a total Canva fan, to the point where my content marketing friends know that if they utter the words “graphics” or “design,” I will launch into a full-blown pitch. Using the site’s incredibly intuitive and user-friendly templates and graphic components, I’ve been able to whip up everything from blog illustrations to Twitter, Facebook, and Google+ headers. Best of all, it’s enormously fun—I get to indulge my inner designer, and play with fonts, filters, backgrounds, and the like to my heart’s content. Good times. But the other day I was browsing through the 100+ designs I’ve created, and suddenly, I was torn between horror and deep embarrassment. Some of my earliest efforts were, how shall I say, dreadful. Proportions were off, colours were garish, there was little to no sense of balance or harmony; in short, I’d made a mess—which I’d then blithely proceeded to spread around the internet. The worst of it was that I didn’t even know it. I was creating terrible designs, and I didn’t know it. I was discussing this with my son, who has worked as a programmer for 15 years, and he made what I think is an apt comparison: in the coding world, certain entry-level languages (PHP, we’re looking at you) make it easy for non-progammers to gain a foothold. They offer a relatively painless way into a very complex field, and teach newbies that they really can create code. However, these languages also have a reputation for encouraging sloppy, repetitive “spaghetti” code, and for fostering poor programming and security habits. This isn’t necessarily the fault of the languages, per se; it’s just that their very ease of use makes them so accessible that newbie coders may believe they’re doing just fine when in fact, they’re creating an unholy mess. And this is an underlying problem with do-it-yourself free online graphic design sites. The fact is, not everyone is great at design, just as not everyone is gifted at creating code…but the DIY design sites arm us with just enough tools to believe we’re (almost) professional designers. 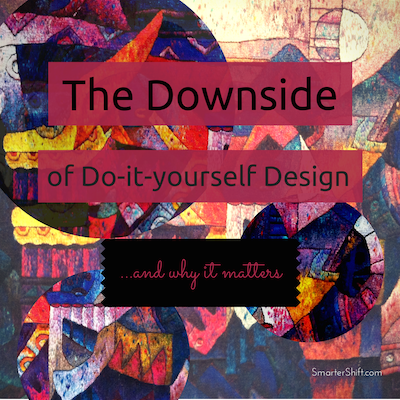 Free design sites don’t make you a designer. Not everyone is great at design. And in comparison to actual design software, free online graphic design sites have very limited functionality: their relative lack of functions is what keeps them simple enough for non-designers to use. Am I saying we shouldn’t use these sites? Absolutely not. You’d have to pry my cold dead fingers off my mouse to make me stop using Canva. But I am saying that before we take our creations public, we should invest our time in learning some design basics, such as balance, repetition, contrast, colour, and texture. We still won’t be pros, but at least we won’t be creating designs that look like they were done by four-year-olds. While I haven’t lost my enthusiasm for Canva, I’ve tempered it with (I hope) a bit of judgment. I’m much more critical of my own designs now, and I am acutely aware that this is a learning process, not a done deal. I’m also very conscious of where my abilities begin and end—and when I should call upon the services of an actual, professional designer. As with any useful tool, we need to know its limitations, what it really can do, and when it makes most sense to use it. What about you? Have you taken advantage of free online graphic design sites? How do you feel about the designs you’ve created? I’d really love to know I’m not alone here. Are you a ContentChat Subscriber? Click Here to receive the latest news and posts as they are published! Smarter strategies to get smarter messages out to the audiences you need to reach. That’s what a Smarter Shift is about. Social media open up new channels—and a whole new list of do’s and don’ts—for anyone who needs effective, targeted communications. So if you’re trying to attract an audience, establish a market, or bring together a community of interest for a new way of doing things, why would you use old techniques to deliver the message?